Bakery Flavoring Emulsions, more flavorful than an extract! When it comes to flavoring, professional bakers almost exclusively use emulsions over alcohol-based extracts. These flavors are more robust and won't "bake-out" when exposed to heat. Emulsions are water-based, alternatives to extracts. The flavor is micro encapsulated in natural stabilizers and suspended in water. This encapsulation enables the flavor not to lose its integrity when exposed to high heat. 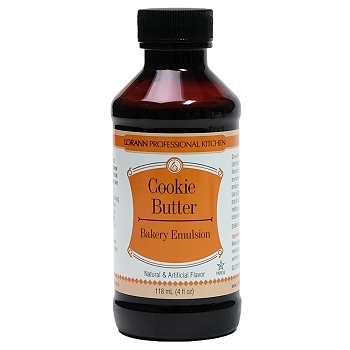 Use emulsions to flavor all baked goods and breads, cake batters, cookie dough's, frostings, fondants, ganaches, fillings etc. • Emulsions have a more potent, robust flavor. • Won't "bake-out" when exposed to heat. Cookie Butter Flavor - adds the warm flavor of European spiced cookies (also known as "speculoos") to your baked goods and frostings. Cookie Butter has notes of cinnamon, ginger, allspice, and clove. It's the taste of Biscoff brand cookies in a bottle! 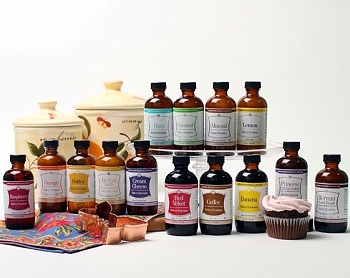 By Lorann Oils, celebrating 50 years, of the finest flavorings and oils.